I have been working on this project for quite some time and am sooo excited to finally share it with you! Last summer for Girls Camp, our leaders designed a fun project for the girls to do in their spare time: stuffing pillows! To prepare the pillows, we had our camp theme printed on some custom-designed fabric. Then a generous sister in the ward sewed the six-by-six-inch pillows, leaving an opening for stuffing. Up at camp, the girls got to stuff and sew closed their own special camp mini-pillow. 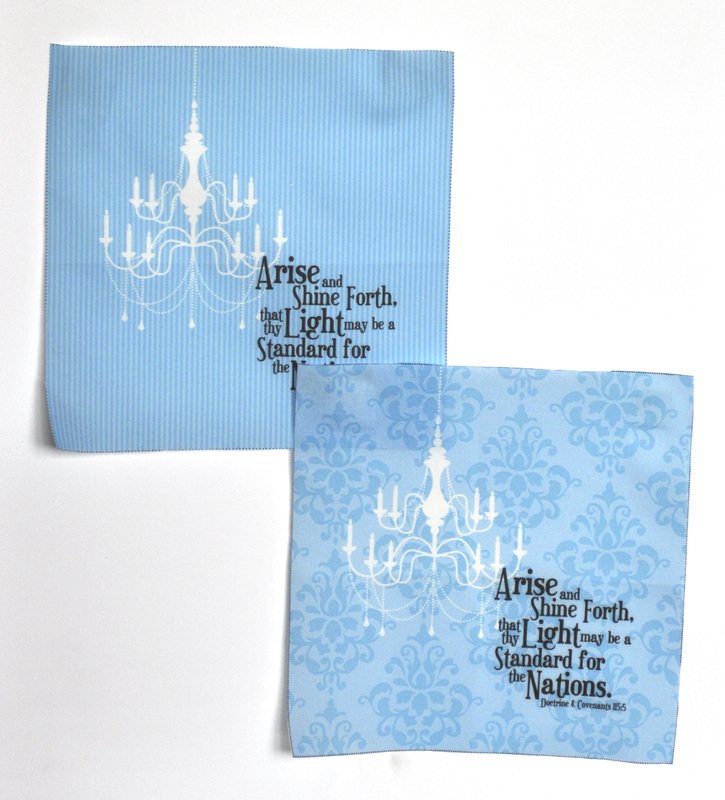 Inspired by how successful the pillows were for our girls, I designed custom-printed fabric pillow fronts featuring my Arise and Shine Forth 2012 Mutual Theme chandelier logo for you to use! You can easily order my design pre-printed on fabric from Spoonflower.com–no trying to print and iron on a design with less-than-stellar results! 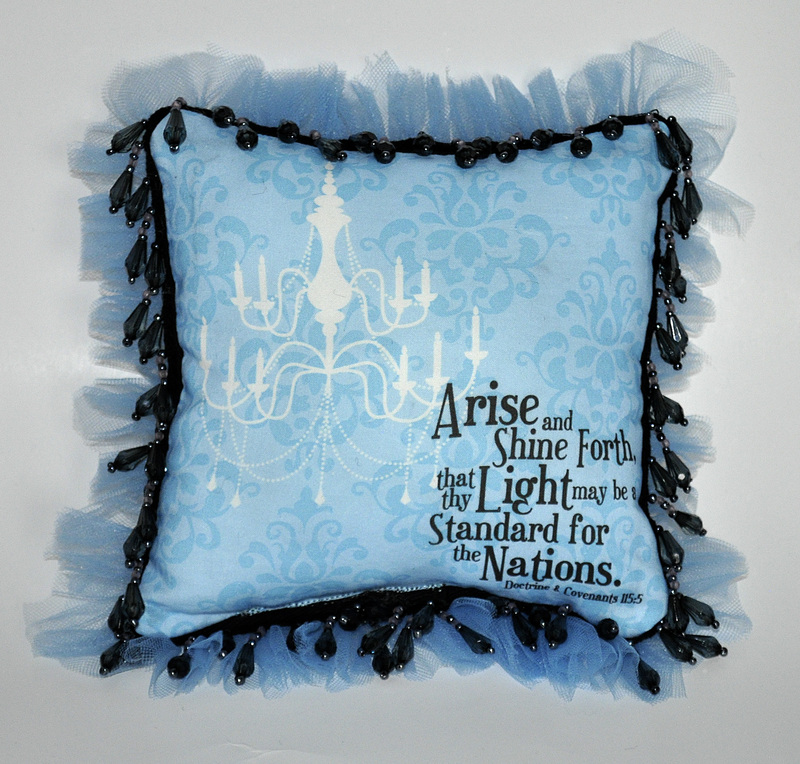 Each eight-by-eight-inch pillow front features the chandelier and full scripture for the Mutual theme. You can select either striped or damask backgrounds. When you order your fabric, you’ll notice I’ve added cutting lines right into the design, so you won’t need to measure at all–just cut on the lines. Better yet, layer the pillow-top fabric on top of purchased black cotton for the pillow backs and cut out both together! I’ve also allowed for a 1/2-inch seam allowance on each side of the pillow front. Make these mini pillows for your girls to put on their beds to remind them to pray and “Arise and Shine Forth” in the morning! Since each pillow front is eight-by-eight-inches square, and each yard of printed fabric is 42-by-36-inches, you get sixteen pillow fronts per yard. At a cost of $18 (US) per yard for the quilting cotton, that makes the cost for each pillow front $1.13 (US)! Add in the cost for black broadcloth/quilting cotton for the backs and poly fiberfill for the stuffing and you have a great gift or craft project for about $2 (US) per girl! You may also have ward members with extra fabric and stuffing they could donate so you don’t have to buy anything but the pillow fronts. If you need just one pillow front, order a sample for $5 (US) plus $1 shipping and you will get one eight-by-eight-inch pillow front. 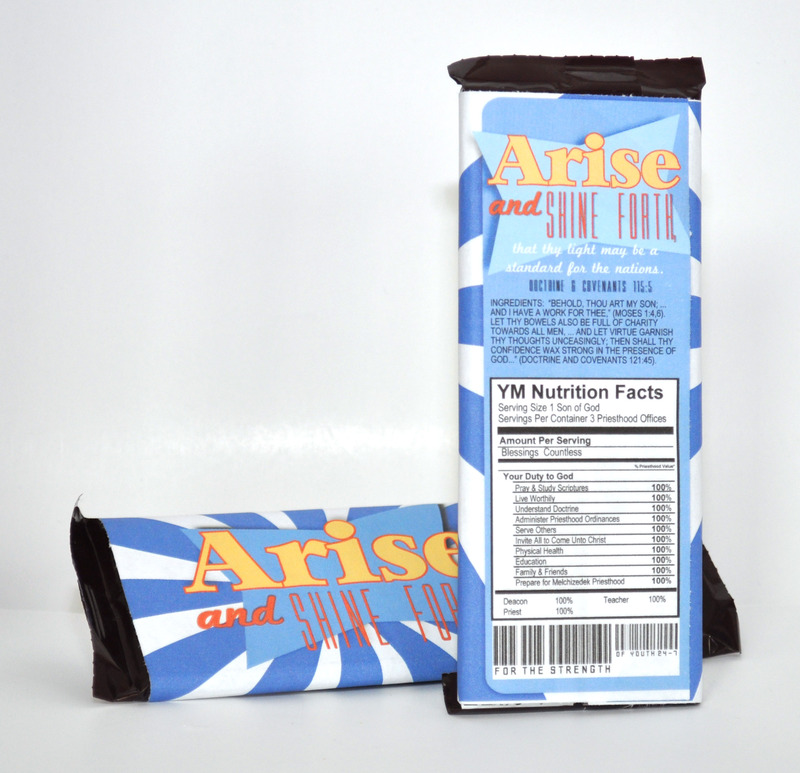 Fat quarters are also available. 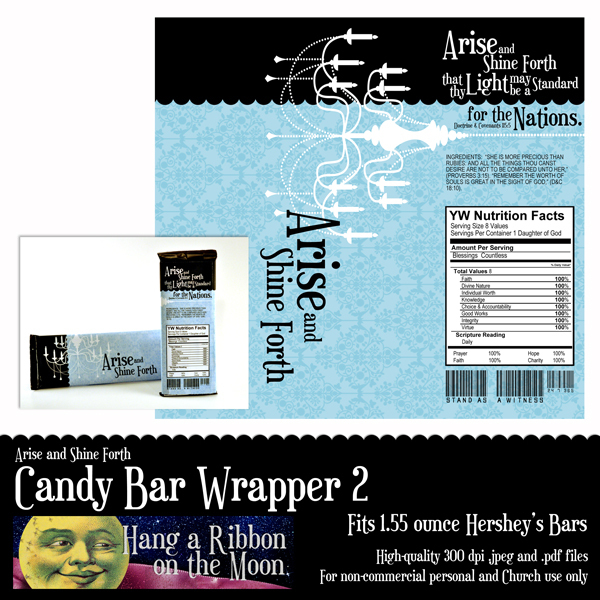 I have more Arise and Shine Forth fabric designs in the works at Spoonflower.com and will release them as soon as I’ve proofed the final prints. They are all-over prints with the chandelier logo or just chandeliers. These prints will work perfectly for pillow backs, or you could combine them with the pillow fronts to make quilts, tote bags, aprons or bandanas. You may want to frame a pillow front for a fast and easy gift. 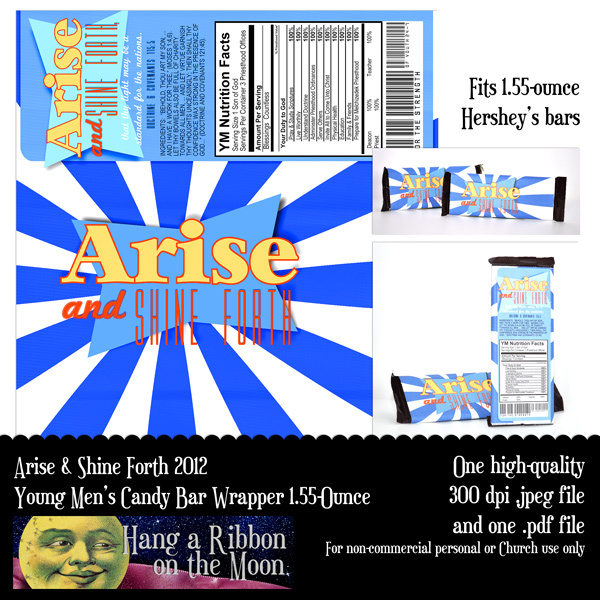 Girls could use my fabric designs to make gifts for Stake leaders, Bishops, camp Secret Sisters or as a Value Project. To make my finished pillow, I used my custom-designed pillow front fabric and a piece of a black fabric remnant for the back plus about 1/4 a yard of inexpensive (about $1 (US) per yard) blue tulle for the ruffle around the edge. I also added some black beaded trim(about 3/4 of a yard) I got at the craft store. This quick project took me just over an hour to sew, stuff and sew closed. Spoonflower.com prints on high-quality fabrics which are washable and colorfast, just like the printed fabrics in the store. Plus, at Spoonflower.com, you can order fabrics in several types: Kona cotton, quilting-weight cotton, cotton poplin, cotton voile, cotton silk, linen-cotton canvas, organic cotton interlock knit, organic cotton sateen, upholstery-weight cotton twill and silk crepe de chine. Check out this page here for more information on fabric options. Calculate the yardage you will need and select the amount you need to order in the “sizes” area. Note: One test swatch will give you one pillow front. If you have any questions about Spoonflower.com fabrics, shipping times and prices or ordering, check out their help page here. I’ve been impressed with their quality and customer service. I am so excited to share this fun project with you! If you decide to make something using my pillow fronts, please be sure to share your project in the comments! A wonderful visitor to this blog pointed out a mistake on the February 2012 calendar–I left off February 29! Oops! I am so glad she let me know so I could fix this problem! I’ve fixed February and the downloads are all updated. In case you just want to download the corrected February files, you can get them here. Thanks again! Now that the holidays are over, I’m back designing and putting together more 2012 Mutual theme printables for you. Today, I have some gift/handout tags. I made these to attach to some crystals we’re giving our girls as favors at New Beginnings. I had them printed on high-quality photo paper at Costco and then cut them out, punched them and added an eyelet and blue ribbon. In order to upload my tags to Costco, I saved two tags on a four-by-six-inch .jpeg document and uploaded it the same way as I would a regular four-by-six-inch photo. That way, I get two tags for the very inexpensive price of one photo print. If you upload my files to Costco, please don’t use their fast uploader–it really makes the print quality poor. Go for the full-resolution option for best results. 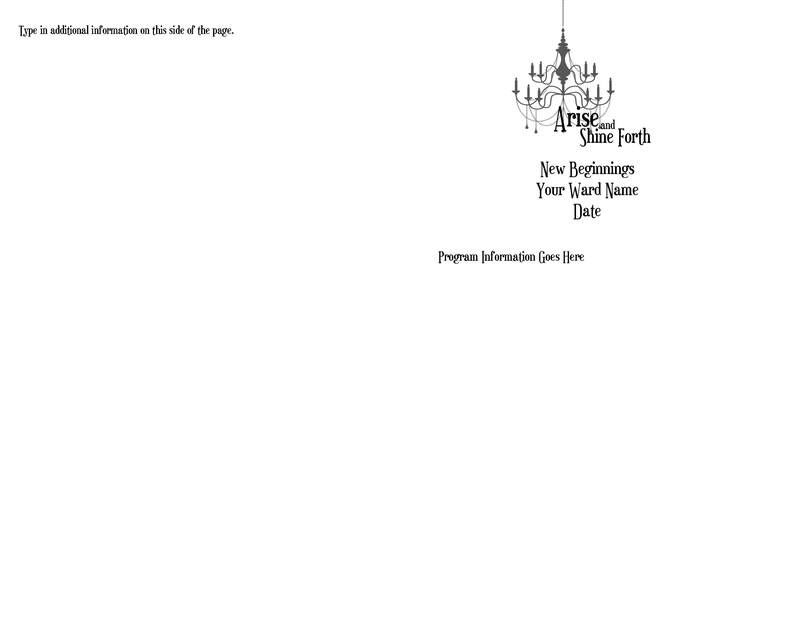 Included in my download for you is the two-tag four-by-six-inch .jpeg, a .pdf with a full page of tags, and a .png file of two tags and a .png of a single tag. I’d love to hear your additional ideas for these tags, so leave a comment below. 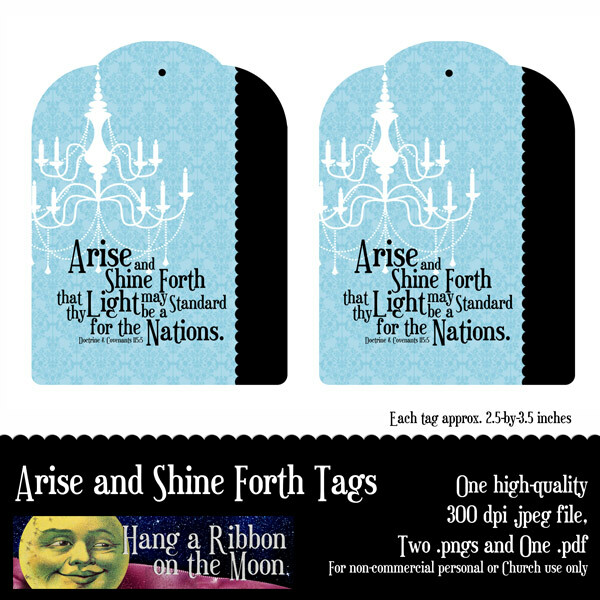 Download my Arise and Shine Forth Gift/Handout Tags here. Note: You will need to unzip the download before you can use the files. Please don’t share these files! I’d love it if you sent your friends here to download their own. All files are for non-commercial home, personal or Church use only. 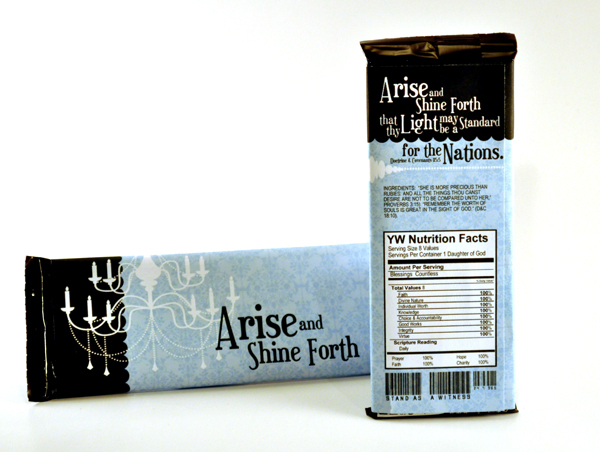 I hope you’re inspired to help your YW arise and shine! 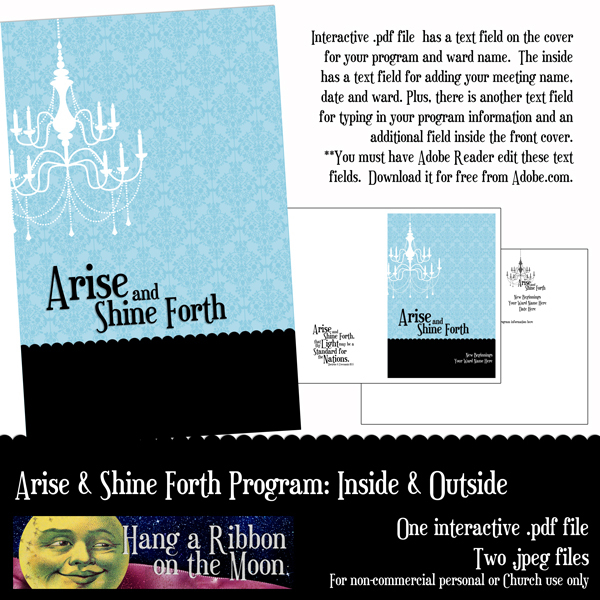 I am so excited to post the first four months of my 2012 Arise and Shine Forth mutual theme calendars. I promise to get the rest done soon, so check back here! Each month of my calendars has a unique background featuring a chandelier and damask-patterned calendar grid, and an inspiring scripture that reinforces this year’s theme. Just in case you missed my explanation of the chandelier and how it relates to the theme, check out this post. I’ve saved the files in both .jpeg and .pdf format. You will need to unzip the files after you download them. 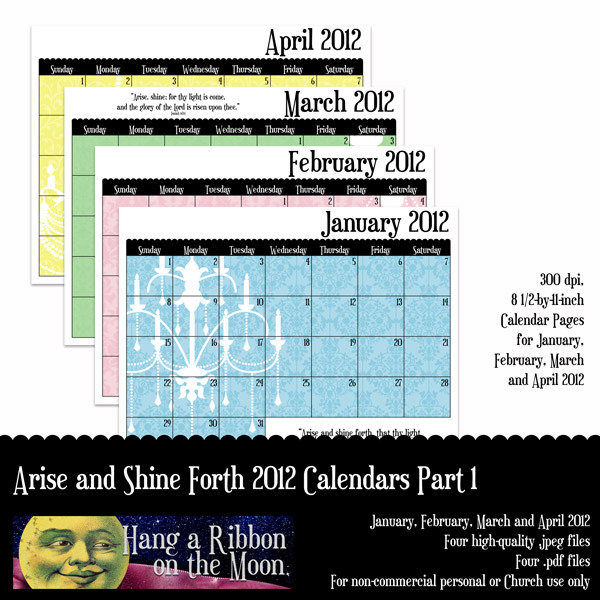 I have two downloads of these calendar pages for you. One has full-page calendars, the other has an extra one-inch margin at the top of each page to allow for binding. 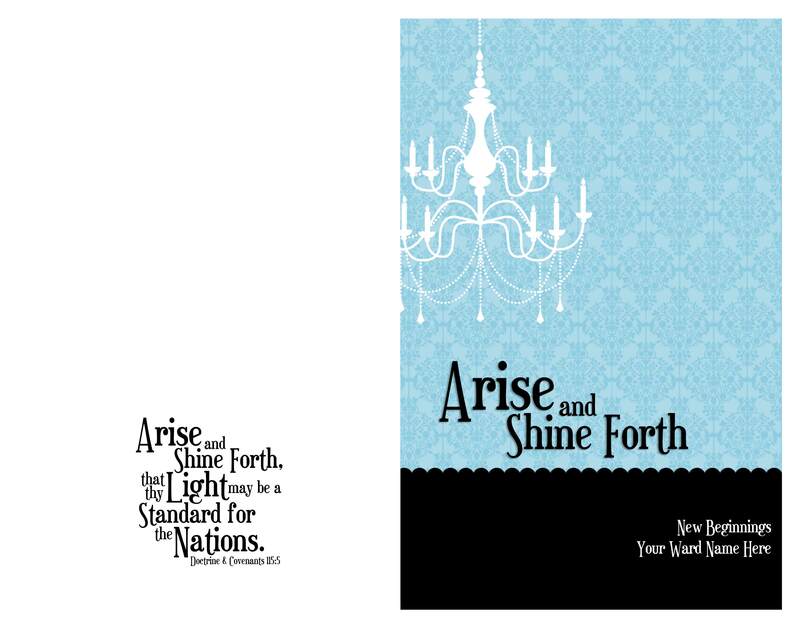 NOTE: You can find download links to my Arise and Shine Forth Calendars Part 2 (May, June, July and August) and Part 3 (September, October, November and December) here. 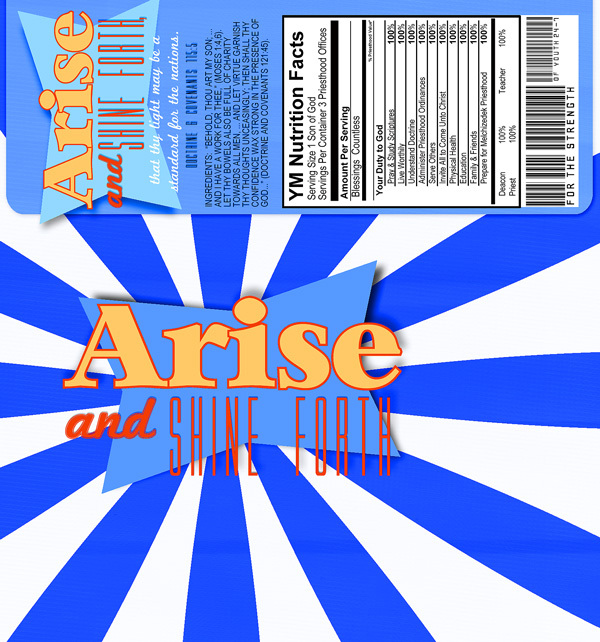 You can download my 2012 Arise and Shine Forth January, February, March and April full-page calendar pages here. Download the calendars with binding border here. Please: Don’t share my files with others. Simply send them to this blog to download their own. My calendar pages are for non-commercial personal, home or Church use. Leave a comment here letting me know how you plan to use this calendar. I’d love to hear your ideas! Watch for the remaining months to appear here soon! “Arise and shine forth, that thy light may be a standard for the nations” (Doctrine and Covenants 115:5). As I thought about this scripture, I kept coming back to the lights in the temple. No, not the light of the temple, the actual lights IN the temple: the gorgeous chandeliers everywhere. I love them! The combination of beautiful crystals and pure light radiating from the temple chandeliers permeates the sealing and Celestial rooms in this sacred place. And, I think that in a way this scripture is beckoning us to be like one of those chandeliers: shine forth! Use the light of the Heavenly Father and the example of Jesus Christ to become a stand-out person in the nations of the world. The chandelier metaphor can go even further in a few ways. First, each individual crystal is important–a unique vessel for amplifying and brightening a room. Similarly, each of us is a unique and important part of Heavenly Father’s work here on Earth. And, although we may feel small and that our part is insignificant, we can still spread the light of Jesus Christ in our own ways. Second, get a few prisms from a chandelier together and they can dramatically increase the light emitted from a single light bulb. Add a ten or twenty more for an even greater effect. The more we work together to amplify our own light, gifts and abilities, the more we as Saints shine for the world. I hope you get the idea. And, that’s why I put a chandelier on my logo designs this year. I have created for you a pack of several different logo variations, in both .png and .jpeg formats. I recommend you use the .png files whenever possible because they have transparent backgrounds (no white behind the words) and you can easily put them on any background you want. You can download the .zip file of my logo designs here. Please, remember not to share the files with others. If you know someone who would like to use them, please direct them to this blog to download their own copy. Thanks! Like these logos? 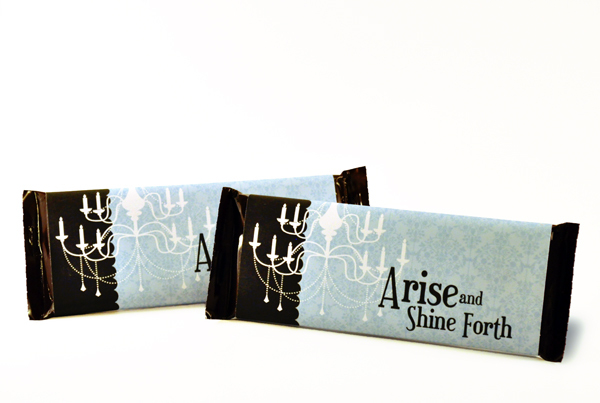 Check back here often–I have created several 2012-themed items including a poster, New Beginnings invite, custom-printed fabric and more–and I will be posting them soon! Enjoy!